Holly Knitlightly: Yogurt & Brussels Sprouts? Man, I love brussels sprouts. The other day I decided to roast them in the oven instead of making them on the stove like I usually do. It's soooo much easier to just coat them in olive oil, put some salt & pepper on them and throw them in the oven for 15-20ish minutes, or until they get nice & brown. 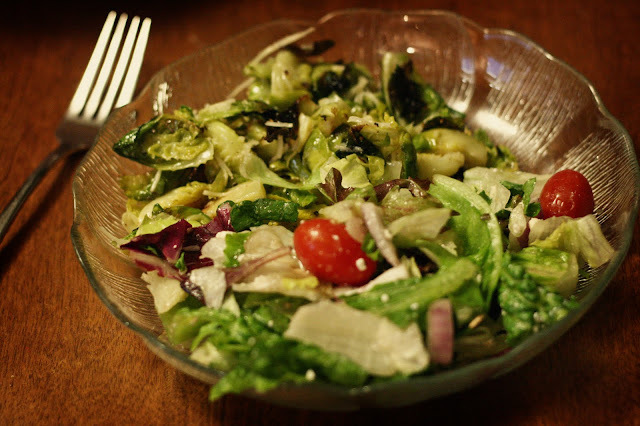 I love the dressing from the brussels sprout salad that I make from Shutterbean, so I mixed it with that afterwards. I also add in a bit of honey, then throw in some Parmesan cheese & it gets all nice and melted and delicious. I ate it with some Greek salad... yum. 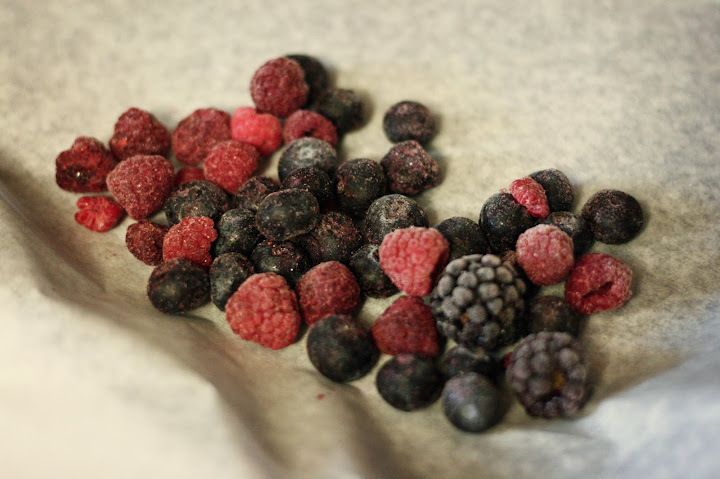 The other day I dipped some frozen blueberries, raspberries & blackberries in some vanilla yogurt. I just used a toothpick to pick up the berries, so I had to wait a bit until they thawed out a bit. And as you can see, I'm pretty messy, ha. They were really good, though. 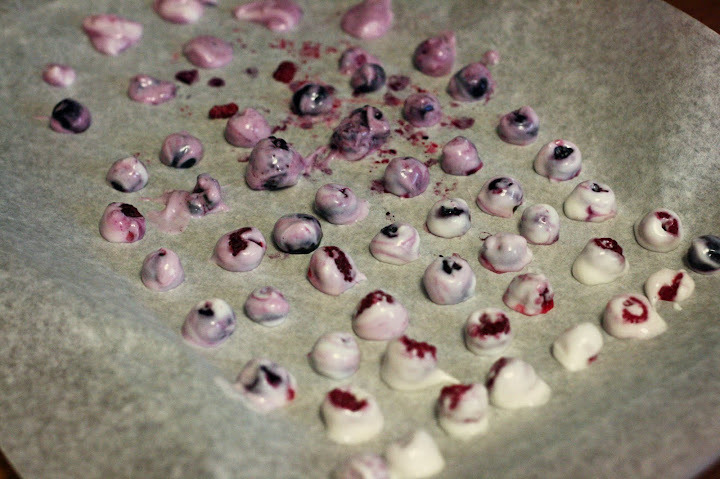 I have to say I preferred the ones that were just yogurt (you can kind of see them at the back, I ran out of berries. Well, I just had a bit of extra yogurt.) with a hint of berry flavour (from dipping all of the berries into the yogurt). I totally ate them all up in one sitting while doing some blog reading, ha. I'll probably be making these again! Have you tried any new recipes lately? I know that these aren't really "recipes", but they are two "newish" things that I tried. Okay, that's enough with the quotation marks, ha. Let me know what new recipes you've tried lately or some recipes you can't wait to try out! ohh your brussel sprouts look so tasty! Yum the brussel sprouts look great! 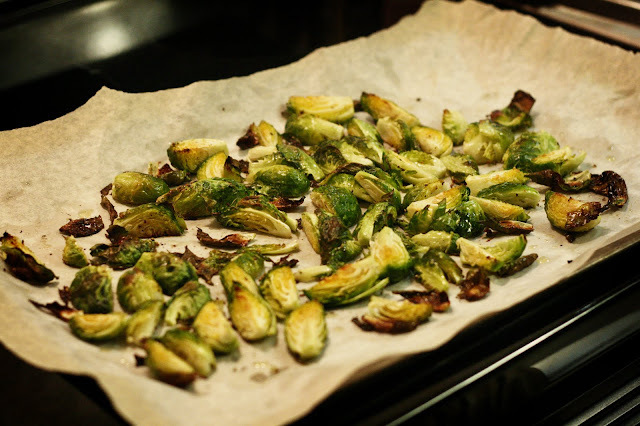 i made brussel sprouts the other day too! was gonna post on my blog soon!! When I was little, my mom had a food dehydrator. It had a plastic sheet that sat on the trays so you could put liquid-y things on it to dry. We would put little dollops of yogurt on the tray and dry them into yogurt chips. If you can find a dehydrator for a good price, it would totally be worth trying. We also did stuff like pineapple and bananas. My boyfriend and I have one, and we use it to dry little cooked pieces of meat for treats for our dog Winston.